Friendly Staff. Quality Hearing Care. Our staff of highly trained hearing aid specialists will fit you with best hearing aids and provide you with the best treatment to suit all of your hearing loss needs. We carry a complete selection of the latest hearing aid devices from leading manufacturers. Our helpful hearing videos can help you better understand the importance of hearing care. Residents of Central Wisconsin look to The Hearing House for technologically advanced hearing healthcare with a warm, personal touch. Schedule your free hearing evaluation with us. If you have no hearing loss, we will tell you. If the cause of your hearing problem appears to be one that requires medical attention, we will let you know. If hearing aids are indicated, we will provide you with the best service and follow-up care anywhere. The Hearing House carries a selection of digital hearing aids to suit different types and severities of hearing loss as well as other requirements of each individual. 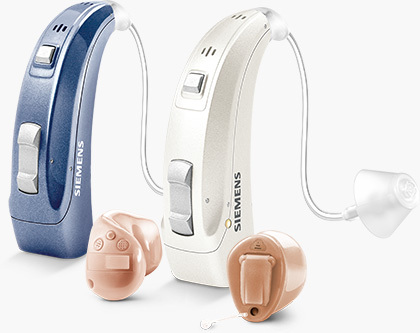 Once we identify your needs, we select the appropriate instrument from Siemens Hearing Instruments or several other fine brands of hearing aids we carry. You can purchase with confidence knowing that free service for the life of your hearing aid is included in the purchase price. The first step in determining your hearing capability is a hearing evaluation by one of our Board Certified Hearing Instrument Specialist. If you have a hearing loss, it will detail the extent, type, and specifics of your particular hearing loss. It is recommended that you bring a family member with you to the evaluation appointment to help you understand the information and recommendations. We look forward to helping you and your family with all of your hearing healthcare needs. Visit one of our 4 locations today!